within easy walking distance of the house. the breathtaking sunrise and sunset views. system, ceiling fan and small sleep sofa. cabinet next to the bedroom. shopping, movie theatres and restaurants.Hiking trails are within easy walking distance. Many vacationers choose to enjoy the scenery here by taking red rock jeep tours, airplane or helicopter rides or hot air balloon adventures. It takes only 2 hours to drive to the Grand Canyon for one of the most spectacular shows of natural beauty to be seen anywhere on earth. Tours of the Navajo and Hopi reservations are also available and popular. Fun day trips are Oak Creek Canyon, Jerome, Prescott and Flagstaff. 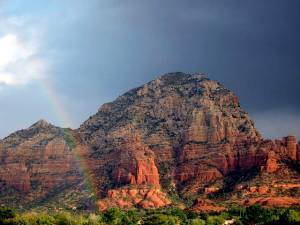 In a sentence: "There's lots to see and do in Sedona!" The casita is a gem! The views were amazing and the accommodations were quite comfortable and felt like a home away from home. It was the perfect place to relax and enjoy the red rock views after a day of hiking or off-roading in a jeep. Sedona has shops, fine dining, and wondrous scenery -- it doesn't get better than this! This "Enchanted Casita" is truly that! A perfect locale in the hills of Arizona, surrounded by the Red Rocks further enhances the awesome experience of staying in this beautiful home. Everything that you need is in this haven that makes you feel at home as soon as you walk in the door. Tastefully appointed and well taken care of, I would recommend this place to anyone who wants to get away and feel like they've discovered their own "private world". Kudos to the owner and we'll definitely want to come here again! We highly recommend Casita do los Santos in Sedona. We are hikers and it is wonderfully located close to hundreds of hiking trails, as well as town with its stores and restaurants. It is very cozy and has a private outdoor hot tub with a view of the red rocks, and an inside wood-burning fireplace for the cool winter evenings. The bedroom has a very large picture window with beautiful vistas of the surrounding red rocks and mountains. The casita sits on a hill, offering views of nature scenery and privacy from nearby homes. The patio provides a perfect vantage point for the dramatic evening sunsets, with a gas grille that enabled us to cook great dinners, just like being at home. We enjoyed our stay so much that we plan to return ofter. 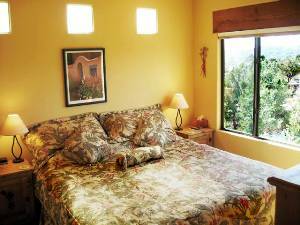 If you visit Sedona you can do no better than to stay at the Casita de los Santos. It is the perfect vacation rental and Polly is the perfect hostess. We emailed Polly that we would be arriving late from Phoenix our first night and we found the path to the house lit and the inside lights on so we could easily find our way. The location is wonderful...close to trails and the red rocks, yet only five minutes from town. The Casita is colorful and homey, designed by an artist, and has a true Southwestern feeling. It is very clean and well cared for. You are in a neighborhood yet feel very secluded. The views from the patio are spectacular. It was delightful to see Gambels quail with their funny plumed heads running around the "yard" each morning. The kitchen is compact but well equipped. It is easy to cook meals at "home" and delightful to eat them on the patio. With the washer and dryer you can pack light and don't have to pay for extra baggage. I cannot end this without mentioning how wonderful the hot tub was after a day on the trails or at night as a comfy spot to view the stars. If you have a chance to stay at the Casita, do it. You won't be sorry. We had a wonderful stay at the Casita last summer. It is a charming and cozy little cottage perfect for a couple looking to spend some quite time in Sedona. Because it is in a residential area, you are away from the main tourist spots, crowds and noise. Very private! But downtown is only about five minutes away if you want to shop or go out for dinner. There are tons of hiking trails close by, and yes, some within walking distance. The hot tub is a great perk, even in hot weather. We loved watching the sunset from the hot tub each evening. Spectacular views! My husband spent the first two days just thanking me for booking the Casita! We had a wonderful time! We found the Casita de los Santos to be everything we hoped it would be. Polly keeps the enchanting Casita in immaculate condition and it quickly became our "home away from home" while visiting Sedona. One could not ask for better views of Thunder Mountain and Chimney Rock. The sunsets were beautiful from the Casita patio. We particularly enjoyed the abundant wildlife that lived below the Casita in the dry stream, just down the hill below the Casita. There were Quail, rabbits, chipmunks and lots of bluebirds and Cardinals. 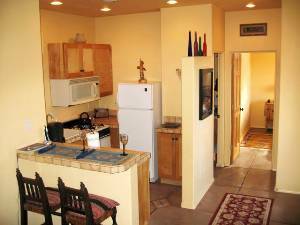 The Casita was just minutes away from any point in Sedona and we found it very convenient. Thank you Polly for a great time in Sedona. See you soon. The Casita de los Santos was a wonderful place to rest, relax and catch my breath after hiking the local trails during the day in the scenic Sedona area. It is very cozy, and had everything I needed to be comfortable. The casita is in a quiet spot, and I enjoyed watching the birds and hot air balloons during the early morning from the patio, and stargazing from the hot tub at night. I enjoyed day trips to Jerome and the Grand Canyon, and Flagstaff is also a close but scenic drive away. Sedona itself has plenty of shopping, galleries restaurants and fun things to do. I hope to get back to the Casita de los Santos soon, as no other place in Sedona will compare! Took a chance and got a grand slam. This vacation rental was perfect for the two of us in every way-- price, location, views and amenities. 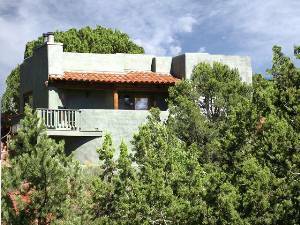 This very private Casita sits on a hill in West Sedona. The space is generous with a nice living area with fireplace and kitchen. The king size bed was terrific with private bathroom and all the accommodations of a home. The best feature was the patio with another fireplace and the greatest view that a grand hotel could never provide. I sat each morning sipping my coffee watching the hot air balloons float up in the distance. The patio faces west with the sunset lighting the golden rocks of Sedona's Thunder Mountain. The Casita is in walking distance to great trails. The central location also provides easy driving distance to shopping, great food and all the sites of Sedona. It was also wonderful to relax after sightseeing all day in the very private hot tub. I sat back and relaxed watching the shooting stars. I stopped counting the first night, too many to wish on. This is a great spot if you want a private home like experience. Can't say enough nice things about the Casita. The first thing I did when I got home was to rebook for the next year! Happy traveling. We've stayed at the casita about 6 times over the past several years. 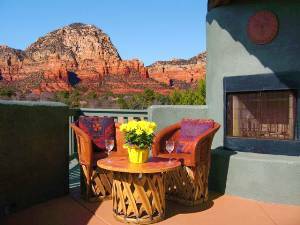 It's been a great place to stay: centrally located in West Sedona, excellent patio with a nice view, outdoor hot tub that's very private but great for star-gazing, and just the right amount of room for two people. Polly keeps the place well maintained and in pristine condition. We really enjoy it - it is an excellent and economical alternative to the hustle and bustle of a hotel/motel. It feels like a home away from home for us at this point. We definitely strongly recommend this place! My husband and I couldn't have imagined a more perfect place to stay in Sedona. Even after touring the area by car for days on end, there were no better red rock views anywhere than those from the casita! You feel like you are sitting at the base of Thunder Mountain and Chimney Rock while in the living room or on the patio. When you open your eyes in the morning, beautiful red rock formations dominate the sky, which is often dotted with hot air balloons. You don't even have to get out of bed to enjoy the majesty! 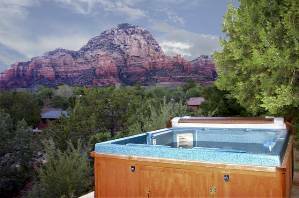 The hot tub is situated for prime sunset viewing and privacy. 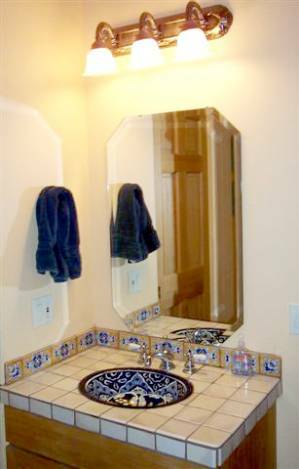 The casita is attractively decorated, well-equipped and clean as a whistle. The king bed is very comfortable. The entire property is very well-maintained and is located five minutes from restaurants, shopping, grocery stores and the main highway through town. You'd never know it, though, when you are gazing at the stars from the patio or hot tub. Since Sedona is a "dark skies" city, you have the opportunity to see the sky as it would appear far away from civilization. Talk about ambiance! The casita made our stay in Sedona one of the best vacations ever. We will surely return as often as possible. We stayed at the casita for our honeymoon and it definitely exceeded all expectations. The home is a great getaway and while it is located in a neighborhood, it has the isolation feel of a real county cabin. Sedona has much to offer and can be a very reasonable trip if you enjoy the outdoors and take advantage of deals. Also, being from the Midwest, it is often difficult to get to "tourist destinations" without wasting full days due to traveling but Sedona is very close to PHX and is just a short flight away. We were at other casita within 6 hours of leaving downtown Omaha. I would definitely go back and stay at the Casita again. Polly is a great host and a good friend to have! This location was exactly what we wanted and needed! The property exceeded our expectations.The casita provided us with all the comforts of home but also incredible views of the red rocks, hot air balloons, and beautiful sunsets. The hiking trails within walking distance were perfect to start our day. We felt secluded and private yet just minutes from great restaurants and shops. The patio, and hot tub had beautiful views both sunrise and sunset. We will definitely return! The casita and environment were as described in the advertisement: perfect! The views of the mountains from the patio and also from the windows in the bedroom and living room were spectacular! The casita was well laid out and nicely furnished. I esp. appreciated that fact that provisions for basic supplies had been made (e.g., no need to go out and buy spices or cleaning materials or toilet paper or laundry soaps, etc.). It was a real plus to have laundry facilities and a dishwasher available as well as a DVD machine along with the TV. The casita is very well located = close to stores and uptown Sedona as well as hiking trails and parks (and the vortexes) but away from the noise and bustle of the "touristy" parts of Sedona. I appreciated the privacy, the peace and quiet and the beauty of the location. It was also a plus that the owner was not intrusive but yet was available for questions that arose. All in all, I highly and heartily recommend the casita and will remember my stay there as a time of tranquility, beauty and peace and quiet. My husband and I stayed here during the week of 9/6-9/13/08 and just loved it. The views are amazing. The location in West Sedona gives you easy and quick access to anything you want to do in Sedona. The house is beautiful and had everything we needed. We made much use of the patio and enjoyed looking at the stars while in the hot tub. Thank you, Polly, for the warm and wonderful environment of the casita. What a beautiful week in Sedona to rest, refresh and to heal. I look forward to coming back on a yearly basis to reconnbect with the spiritual energy and to renew my mind and body. Staying in the casita, with the incredible views and privacy, has been a truly memorable experience. See you next year! Thanks, Polly, for helping to make our honeymoon so special. The casita is beautiful and a refreshing change from hotels. The scenery is amazing and we had such a great time. Thanks Again!!! Dear Polly, Thank you for such a beautiful retreat from our busy lives in Los Angeles. Casita de los Santos, with the fantastic views, was incredible! We couldn't have asked for anything more and appreciate so much that you provide everything that a renter would ever need. Hope to see you again in a few months. What a perfect getaway! The casita is such a wonderful place to stay with the secluded location, beautiful views and quiet surroundings. The hottub made for the perfect ending to our long, adventurous days of hiking, flying and sight seeing. All-in-all, this is the best place we have ever stayed and we had the time of our lives.! What a great way to end our 30th wedding anniversary trip! Casita de los Santos was everything we hoped it would be, and more. The red rock views and the beautiful sunsets on the patio were fantastic!!! The casita was perfect for our honeymoon. You have the best views in the area. It was our first time to Arizona and we fell in love with Sedona. I wish our stay could have been longer, but we promise we'll be back soon. Thank you so very much, Polly, for making the casita the perfect "home away from home"! All of these testimonials were taken from the guest book which is available for renters' comments in the casita. My hours of research on the web were more than rewarded by this fabulous little house. We felt very blessed by all it has to offer. The hottub was a treat every time we used it. It was fun to wake up in the morning to watch the sky brighten and look for the hot air balloons flying in the distance. Perhaps our favorite was the different sunset show each evening as we don't get to see sunsets from our home nestled in the foothills. Thank you for all your thoughtful and homey touches. 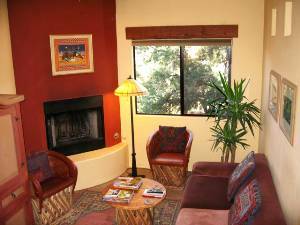 REASONABLE RATES-- ALL INQUIRIES WELCOME-- CALL OWNER FOR RATES AND ADDITIONAL INFORMATION-- SPECIAL SUMMER DISCOUNTED RATES FOR JUNE, JULY AND AUGUST-- RENTALS BEGIN AND END ON A SATURDAY-- PROPERTY COMPLIES WITH CITY OF SEDONA RENTAL CODES. Deposit: Deposit required only if renters bring children with them. Cancellations and Refunds: Refund granted if cancellation made in writing 30 days before rental begins. Cancellation fee of $100 for all cancelled reservations.